Producers: Martin Jurow and Richard Sheperd; screenplay: George Axelrod, from the novel by Truman Capote; photography: Franz Planer; editor: Howard Smith; art director: Roland Anderson; music: Henry Mancini; song: Johnny Mercer; sound: John Wilkinson; assistant director: Bill McGarry; costumes: Edith Head, Givenchy. Cast: Audrey Hepburn ( Holly Golightly ); George Peppard ( Paul Varjak ); Patricia Neal ( 2-E ); Mickey Rooney ( Mr. Yunioshi ); Buddy Ebsen ( Doc Golightly ); Jose Luis de Vilallonga ( Jose da Silva Perriera ); Martin Balsam ( O.J. Berman ); Dorothy Whitney ( Mag Wildwood ); Alan Reed ( Sally Tomato ). Gilliatt, Penelope, "A Fairytale of New York," in Unholy Fools , London 1973. Clark, Leslie, "Brunch on Moon River," in The Modern American Novel and the Movies , edited by Gerald Peary and Roger Schatzkin, New York 1978. Vaccino, Roberto, Edwards , Florence 1979. Brode, Douglas, The Films of the Sixties , New Jersey 1978. Merbaum, Mark, Magill's Survey of Cinema, Volume 1, First Series , edited by Frank Magill, New Jersey 1980. Lehman, Peter, and William Luhr, Blake Edwards , Ohio 1981. Bruno, Edoardo, Blake Edwards: l'occhio composto , Genoa, 1997. Variety (New York), 11 October 1961. Gow, Gordon, in Films and Filming (London), November 1961. Monthly Film Bulletin (London), November 1961. Breen, James, in Sight and Sound (London), Winter 1961/62. Mardore, Michel, "Le sexe d'Holly" in Cahiers du Cinéma (Paris), March 1962. Feinstein, Herbert, "My Gorgeous Darling Sweetheart Angels: Brigitte Bardot and Audrey Hepburn" in Film Quarterly (Berkeley) Spring 1962. Bruno, Eduardo, "I miti infranti" in Filmcritica (Rome), May 1964. Legrand, Gérard, "Diamants sur canapé—Le rendez-vous aveugle de Blake Edwards" in Positif (Paris), November 1987. McGilligan, P., "Irony," Film Comment (New York), vol. 31, November-December, 1995. Although Truman Capote's popular novel served as its basis, the film version of Breakfast at Tiffany's is very much in debt to George Axelrod's contribution. In turn, Axelrod's screenplay owes a considerable amount to Billy Wilder's work. Axelrod and Wilder collaborated on The Seven Year Itch , an Axelrod play which the two adapted for the screen with Wilder directing. And, as in The Seven Year Itch , Breakfast at Tiffany's features an average man and a desirable, eccentric young woman who meet and become involved because they live in the same apartment building. More significant, particularly in regard to the male protagonist, is the film's relationship to Sunset Boulevard . Paul Varjak (George Peppard), like William Holden's character in Wilder's film, is an unfulfilled writer who has taken to a form of prostitution by becoming the kept lover of a rich, older woman. Unlike Gloria Swanson, however, 2-E (Patricia Neal) isn't an actress but she displays a strong theatrical flair: on bursting into Paul's apartment and announcing that she thinks her husband may suspect the affair and has a detective trailing her, 2-E wears a vampire-like costume consisting of a black cape coat and a red turban. But the Wilder film Breakfast at Tiffany's most closely resembles in tone and thematic concern is The Apartment , a comedy-drama in which both the male and female protagonist are involved in a sense in prostituting themselves. While Holly Golightly may not consider herself a prostitute, the film suggests the clients she has expect some sort of sexual favor in return for the "gratuities" they give her. And, as with the Lemmon and MacLaine characters in The Apartment , Paul and Holly are aligned to feelings of alienation, loneliness, and despair. and non-threatening; 4) she attempts to reconstruct herself in a domestic image when she thinks a rich South American wants to marry her. Ultimately, the film's dramatic conflict resides in Holly's refusal to admit that Paul understands her and wants to make a commitment to her and the relationship. In one of the film's most engaging sequences, Holly and Paul spend a day together doing things the other hasn't done: in their final escapade, Holly takes Paul to a five and dime store with the intention that they steal something. In addition to alluding to Holly's child-like sensibility, the action is also telling in that what they wind up stealing are Halloween masks—Holly leaves the store wearing a cat-face mask. During the course of the film, Holly is forced into shedding the various masks she uses to protect herself; the process culminates in a painful confrontation in which she attempts to dismiss Paul and disown her feelings by abandoning Cat. Although Holly's desperate gesture jars her into admitting to her need for affection, the scene carries an emotional intensity that almost undercuts the film's upbeat resolution. Axelrod provides the film with nuanced characterizations and a skillfully constructed screenplay; he creates characters who are intelligent, witty and emotionally complex. Axelrod's contribution is matched by Blake Edwards. Breakfast at Tiffany's is the film that established him as a major directorial presence. Edwards is extremely assured in his handling of a wide range of modes and mood changes. The film encompasses broad farce (arguably, Mickey Rooney's characterization and performance are too silly to warrant racist objections), social satire (the New York City high society fringe element), the playful humour that Holly and Paul exhibit; it also captures the edgy mood swings that Holly displays and the emotional pain she experiences. 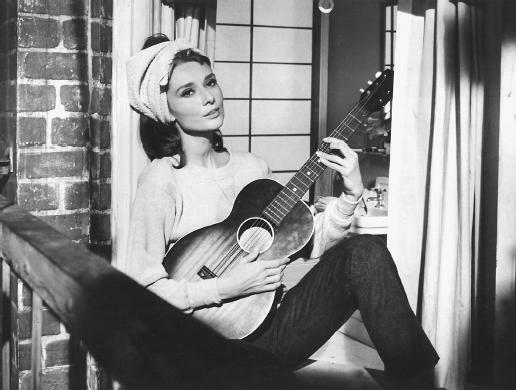 Edwards is ably assisted by Henry Mancini, who in addition to co-writing the melancholy "Moon River," provides the film with a highly evocative score. As Paul Varjak, George Peppard gives a disciplined and highly appealing performance. In what could have easily become a secondary role, Peppard is assertive and compelling but is so in a gentle manner. As did Home From the Hill , Breakfast at Tiffany's indicates that Peppard had the potential to become a great leading man. He had a strong sexual presence and a masculine persona which wasn't dependent on swagger; instead, it is his good looks and low-keyed charm that make him seductive. While Peppard is a great asset, Breakfast at Tiffany's is Audrey Hepburn's film and Holly Golightly is perhaps her most endearing "waif" characterization. On the other hand, the film marks a turning point in her career with Hepburn moving from the child-woman to a more adult, worldly image. In Breakfast at Tiffany's Hepburn is less of an innocent but she manages to maintain her vulnerability and emotional expressiveness. Given that the role has become so significant to Hepburn's career, it is interesting to note that Marilyn Monroe had been the initial choice for the project; instead, Monroe did The Misfits , the film which was intended to reveal her as a mature personality and actor. Ironically, Breakfast at Tiffany's might have better served Monroe's needs than the project which had been conceived specially to spotlight her development. Breakfast at Tiffany's has a fairy tale quality about it but, like Wilder's The Apartment , the film is bittersweet and explores modern day existence with insight and compassion.